I love the combination of oatmeal, cranberries and walnuts. And I real-ly love that combination in cookies. So this morning I pulled out the Kitchenaid, gathered the ingredients, and went to work. I found a recipe I liked, but it needed some tweaking. See, we live at high altitude -- 7,522 feet above sea level -- and that can throw a monkey wrench (or a spatula) into the whole baking-from-scratch process. I've sat through enough "alas, the horrors of mountain baking" stories to know that success often comes through trial and error. I have baked from recipes without making any changes and the results came out perfect. Like my go-to banana quick bread recipe. But this morning's cookie recipe was obstinate. It didn't want to cooperate. The first sheet out of the oven produced cookies like these. Which is okay if you like thin, crisp cookies. But that's not what I was going for. I wanted fat, chewy cookies like these. Here's a photo of the flat and the fat next to each other. See the difference? Flat n' crispy vs. fat n' chewy. Following is the high-altitude recipe. I've noted to decrease the flour to 1 cup if you're baking at low altitude. 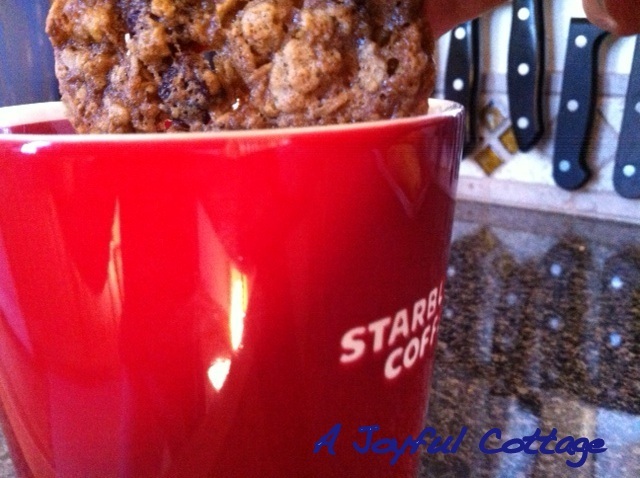 Combine flour, baking soda, ground cinnamon and salt in bowl and set aside. Cream butter, sugar and brown sugar in large bowl on medium speed until light and fluffy. Beat in eggs, one at a time. Add vanilla. Add the dry ingredients and beat just until mixed in. Don't overmix. Stir in oats, cranberries and walnuts. Bake 8 - 11 minutes, or until golden brown. Ovens and cooking times vary, so keep an eye on your cookies. Sweet cranberries and crunchy walnuts with the wholesome goodness of oatmeal. Very tasty with coffee. By the way, all is not lost with the flat, crispy cookies. Dennis took some to dunk in his coffee. Sharing with You're Gonna Love it Tuesday. Now those flat n' crispy and flat n' chewy look simply dee-lish! Both, each, all . . . Your foodie photos are fantastic! And I'm sure the recipes are too. You made me want to leave my computer and head for the kitchen to make cookies! Thanks, Rian, for the kind words. if you do make cookies, I hope it'll be a fun experience for you. Blessings. Sue, I had to google "anzac biscuits" because I had no idea what they are. LOL. They're similar to an American oatmeal cookie. I read: "The ANZACs were WWI soldiers from the Australian and New Zealand Army Corps. The crunchy ANZAC biscuit was made by women on the home front and sent across the sea to their soldiers." I love this! Thanks for leading me to do a little research about one of your country's traditions. Hugs. Those are so tempting. I have been dieting, so looking at these wonderful yummies is so bad for me. Oh, I didn't mean to tempt you, Linda. I haven't baked cookies for ages, but my husband has been asking for some so I made him promise not to over indulge. LOL. (Yeah, right.) Thanks for popping in. Cheers. Right now I would love the thin and crispy ones...but the others look delicious, too. These look so good! My cookies are usually thin and crispy but I would like for them to be thicker and chewy. Not at high altitude here but might need to add a little extra flour to get those results. Cranberry is my favorite. I keep bags of frozen ones in the freezer from November and use them all year. I wonder how it would be to do half dried and half frozen? You have me craving banana bread and cookies now! I've got ripe bananas, Fiona, so I think there's fresh baked banana bread in our immediate future. :) Hope your week's off to a great start. I just found your blog and glad I did. You live in a very pretty state, my daughter and her family lived there about 4 years stationed on fort carson. We had a wonderful time visiting pikes peake and just riding around areas checking out all of the beautiful country side. I will be back to look around more. Hi Betsy, Thanks for leaving such a nice comment. So glad you stopped by. I'm off to check out your blog right now. Blessings. AMAZING!!!! Thats all I can say. I live in a lower altitude (texas) so I used less flour and they are just what the doctor ordered. Pregnant and these cookiea are what I have been craving!! Thank you very much!